Until 2016, Denver’s Union Station shared with St. Paul Union Depot the distinction of being the most elaborate renovated railroad station in the United States to be served by only one train a day. That has changed, and by the end of 2016, Denver will be one of the busiest passenger terminals in the Amtrak network. 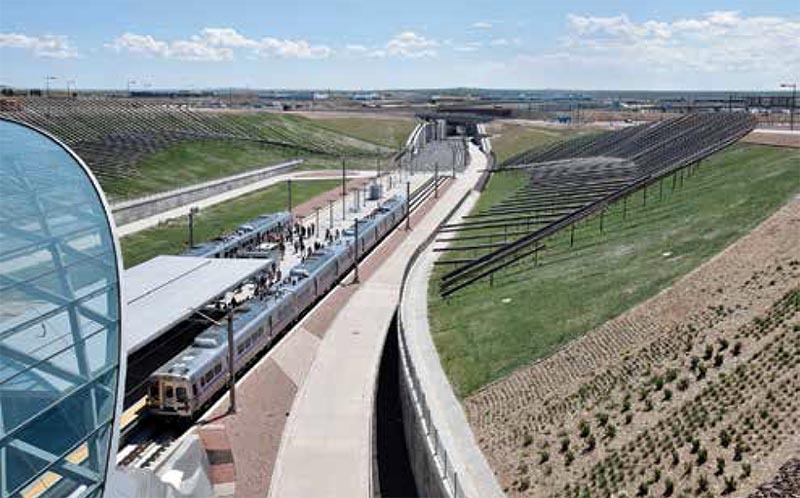 Denver is building a brand-new passenger railroad from the ground up, starting with a connection to Denver International Airport using m.u. cars—not streetcars (like Minneapolis) or trackless trolleys (like Boston), but full-size passenger trains. They will be running around the clock, linking the Mile High City to the world. On April 22, 2016, Denver opened its A Line, with two other lines to open before the end of the year. Amtrak’s California Zephyr and its passengers will have plenty of company in Denver Union Station, without a whiff of additional diesel fumes in the place. 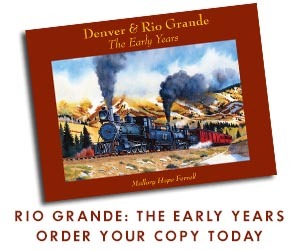 Known as the Eagle P3 project (P3 being an acronym for public-private partner-ship), this is a $2 billion enterprise to design, construct, and operate a commuter railroad feeding into LoDo (Lower Downtown Denver) from suburban communities to the north of the capital city. The A Line, a 23-mile, double-tracked electrified railroad, is the first route of the system to open. The winner of a naming rights competition was the University of Colorado, so the airport line is known as the University of Colorado A Line, even though it goes nowhere near Boulder, which will be served by the B Line when it opens. 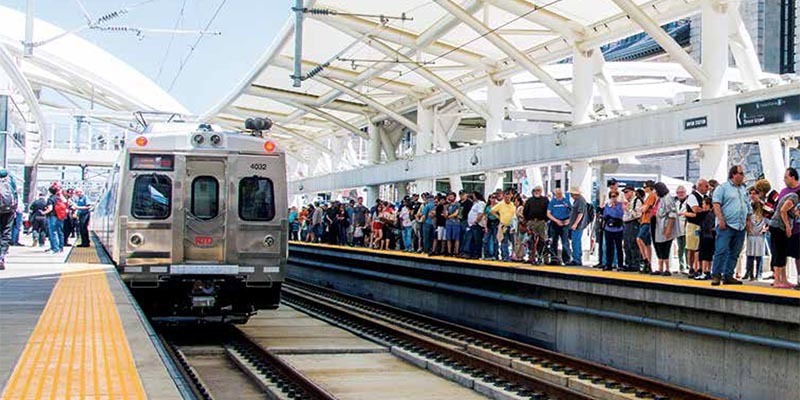 The commuter lines all begin at stub-end tracks at Denver Union Station, which also boasts an underground terminal for suburban and intercity buses as well as light-rail tracks for the city streetcar system, a hotel, shops, and dining facilities. Even Greyhound serves the station, although it has its own depot several blocks away. The six-mile Northwest “B” Line doesn’t quite make it to Boulder. 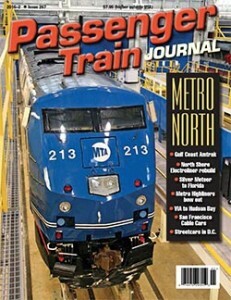 Although a Boulder–Denver connection was touted in the selling of the FastTraks bond issue election campaign, the Northwest line will open in 2016 only as far as Westminster. Beyond that point, the route is as yet undetermined. Meanwhile, RTD’s buses link Colorado’s capital to its main university campus. Plans are for the B Line to share right-of-way with BNSF’s freight line. A third commuter route (the Gold Line) will open in the fall of 2016. This line will link Union Station with the western suburb of Wheat Ridge, in Adams County. All three lines will originate at the Train Hall of Union Station, and for the first time since the discontinuance of the Ski Train there will be a choice of routes for rail passengers. Union Station is the only connection the commuter-rail system will have with the Amtrak network. RTD dispatchers will control all movements in and out of the passenger train terminal, including Amtrak, private cars, and whatever freight railroads need to use the trackage. There is no longer a through connection to lines south of the terminal. 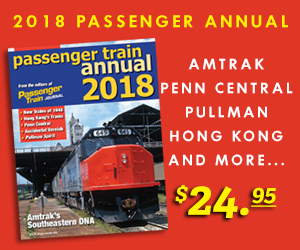 Read the rest of this article in the 2016-2 issue of Passenger Train Journal!